Bottom Line: Count me among the many that enjoyed, but was somewhat disappointed, by Ridley Scott’s Alien prequel Prometheus in 2012. I only saw it once and if you’re thinking about seeing Alien: Covenant soon, I’d recommend taking another look at Prometheus first. Covenant picks up about ten years after the Prometheus’ ill-fated mission, with the crew of the Covenant landing on the same planet to investigate a signal that sounds like it could have a human origin. Having not revisited the previous film, I found myself confused about a number of things. Particularly, there’s a rather strange scene in the middle of this film that involves the alien DNA and it wasn’t clear to me whether it was some sort of dream sequence or an actual revelation. I felt like this scene was meant to tell us where the aliens really originated from, but it seemed so bizarre I wasn’t sure if we were meant to believe it. I can’t really expound on this confusion without getting too spoilery, but I’ll just say watching Prometheus again will definitely increase your enjoyment of this film. Unlike Prometheus, Convenant is an Alien prequel through and through. If fans of the series were disappointed with Prometheus‘ audacity to veer off course and try to be something different, they will probably be happy with this film. After introducing us to the crew of the Covenant and sending them to the planet containing the alien pathogen, it’s not long before we have things exploding from abdomens and covering human faces. 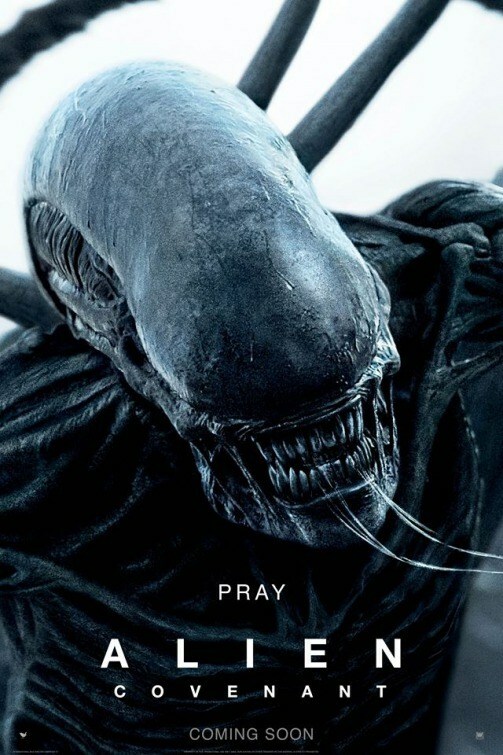 I have to say Ridley Scott does a great job of maximizing the tension, considering everyone in the audience understands the threat this time around. The alien scenes might not be scary, exactly, but they are taut and exhilarating and the film’s score really adds to the atmosphere. I really have to give credit to the film’s creators for taking what started out as a very simple creature, the alien, one of the horror genre’s most notable monsters, and giving it an origin that is complex and interesting. It’s the kind of treatment that I hope Freddy Krueger gets one day. Am I the only one that thinks that there’s a great Freddy Krueger origin story out there somewhere? Additionally, Scott and the writers weave the events of Prometheus seamlessly into this film and makes them totally relevant, despite the fact that it was a film that stood completely on its own. Michael Fassbender’s performance in Prometheus as the android David was universally acclaimed and he returns here as a new android named Walter that has some updated modifications to make him more compliant and Fassbender once again delivers top notch work. I’d go as far as to say he’s even better in this film and continues to rise of my list of favorite current actors. The rest of the cast is kind of unremarkable, but it’s worth noting that Danny McBride is in this film and he’s not trying to be funny. It’s weird and it feels miscast, but I didn’t hate him in the movie and he actually does a decent job of doing dramatic acting. Katherine Waterston’s Daniels is basically a clone of Sigourney Weaver’s Ripley and it’s kind of hard to ignore the similarities – or the failure to measure up. In a way, it’s actually kind of insulting. Alien: Covenant lacks the originality of its predecessor, but it should give fans of the Alien franchise exactly what they are looking for. It’s fun, exciting, and, like Prometheus, beautifully shot. With great action and all the tropes you’d expect from the series, plus another fantastic performance from Fassbender, Alien: Covenant is a fun, if not amazing, time at the movies. Sequel Potential: …because there should at least one more movie before going full circle and reaching the events of Alien. It doesn’t look like anyone is officially attached at the moment, but it’s certainly in the works. Oscar Potential: Prometheus got a Visual Effects nom, so I guess this should be drawing live at the same category. It would be strange for Michael Fassbender to get an acting nomination for a prequel sequel, but his work here is plenty noteworthy. Are the Seattle Mariners the worst MLB franchise of all time? -Only four teams have a worse win percentage than the Mariners (.469): Rockies (.468), Marlins (.468), Padres (.462), Rays (.462). -Of those four teams, all of them have been to the World Series. The Marlins have won it twice. The Mariners have never played for the title. -The only other current franchise with no World Series appearance is the Washington Nationals and they are currently on a run that rivals the only run the Mariners ever had from 1995 to 2001. The Nats have made the playoffs multiple times in recent years and are title contenders in 2017. The Nats also have a win percentage of .486. -Only the Rays (2), Marlins (0), and Rockies (0) have less division titles than the Mariners (3), but all three of those teams have been around for 15-20 less years and have already been to the World Series. The Rockies also have a chance to crack that goose egg this year. -Only the Rockies (3) and the Marlins (2) have been to the playoffs less times than the Mariners (4), but they’ve been around for half the time and have both been to the World Series. -The Brewers have won as many division titles (3) and have been to the playoffs as many times (4) as the Ms, but they also have a higher win percentage (.477) and have been to one World Series. With about a decade on the Mariners, Seattle has some time to establish itself as the better franchise, but as of this writing, the Brewers are in first place in the NL Central. -The Padres have been around as long as the Brewers and have managed two more division titles (5) than the Mariners and one more playoff appearance (5) and while they have a worse all time win percentage, they have been to the World Series twice. -The Mariners didn’t reach the playoffs until their 19th season. The Padres reached the postseason and the World Series in their 16th year. The Nationals, then known as the Montreal Expos, made their first playoff appearance in year #13 and then they tortured their fan base with a 31 year drought before their current run of good fortune. The Brewers also made the playoffs in their 13th year and then the World Series in their 14th. Rays fans only had to wait 11 years to make the playoffs and immediately got a World Series appearance. The Rockies made the playoffs in their third year and reached the World Series in year 15. -The Mariners have sandwiched a solid seven season run from 1995 to 2001 in between postseason droughts of 19 seasons and 15 seasons (and counting) – currently the longest playoff drought in all four major sports. So are the Mariners the worst baseball franchise in MLB? You tell me. Note: After spending several hours writing this (and planning separate entries for Netflix and music), I have to ask myself: is it really worth the time and effort to do stuff like this and the answer is a pretty easy no. My blog only gets a modest number of hits and I’ve struggled to expand my audience beyond my friends and family so I will be cutting the depth of my posts down considerably in an effort to spend my free time more effectively. My ultimate goal is to streamline my thoughts and opinions in a way that is still interesting but not as time consuming for me (or you). Added my rating for The Secret Lives Of Pets to the 2016 Movie Ratings page. I gave it a 5.5 which is somewhere between “Watchable” and “Recommended.” It was a cute, charming, and very short (80 minutes) kid’s movie, but make no mistake, kids are the target audience here. 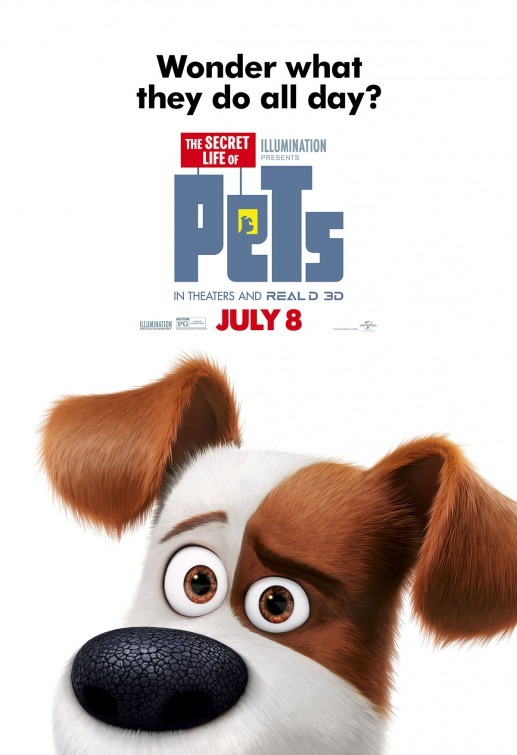 It’s not totally unappealing to adults, but it’s not nearly as clever or as funny as the Toy Story movies and it’s pretty obvious this movie wanted to be the pet version of Toy Story. I have added a number of ratings for recent music releases to my 2017 Albums page and this seems to be the best way to organize them. I’m not really interested in writing full album reviews, but this is an easy way to see what I think the best albums are. I usually have to listen to an album two or three times to know how I really feel about it, so a number of new releases either take a while to get to that point or never do. Thanks for all the awesome feedback on my DMX and Biggie profiles. The next artist I’m going to highlight is Brother Ali, one of the most overlooked emcees of all-time, fresh off another solid album release this month. I’m heading to Vegas for the WSOP in June and I’m going to try and be distraction free while I’m there, so the Brother Ali update won’t be published until July and it will be unlikely I make any posts while I’m in Vegas at all. After getting in some heated debates on Facebook, it became apparent that I needed to assess the career of DMX next to either support my claim that he’s overrated or discover that maybe I’m wrong and he didn’t fall off as hard as I think he did. It’s interesting to me that so many people can consider DMX one of the greats considering that he’s still active but hasn’t really been relevant since 2001 – that’s over 15 years of making music no one is really listening to! It’s one thing to be talented and overlooked, but considering DMX’s tremendous success in the past one has to assume people stopped listening because he stopped making good music. I can admit that I have skipped pretty much all of his music since The Great Depression was released in 2001, but it was my contention that if it was any good someone would have recommended it to me. Still, it is unfair of me to make that claim with certainty unless I listened to all of it myself, so I spent the last several weeks going through pretty much the entire discography of DMX in order to assess his place in hip-hop history with all the relevant information, and that includes all the music he’s released since his life has become overcome by drug addiction and frequent arrests. 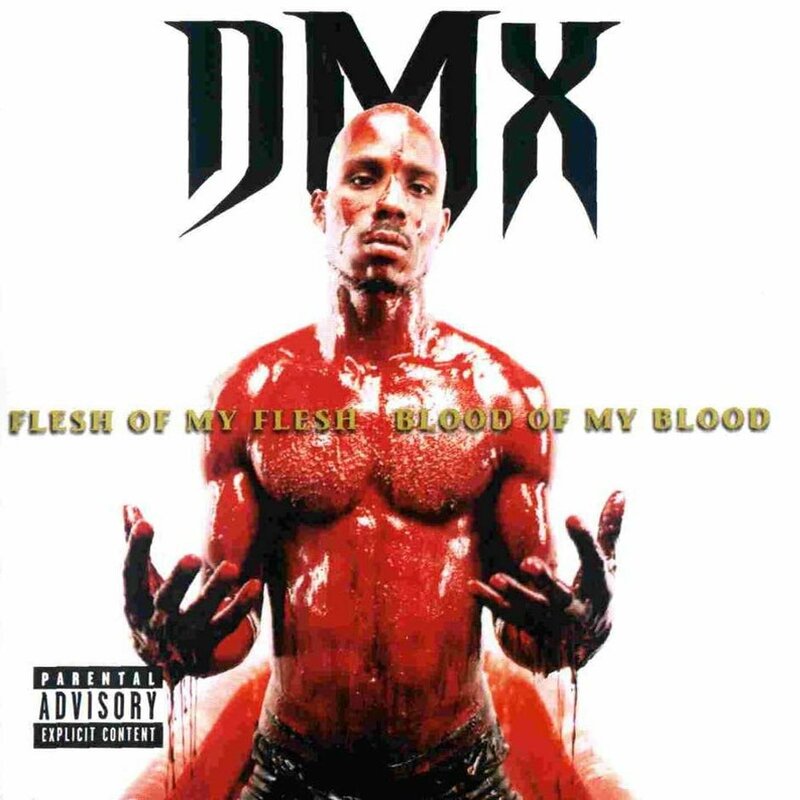 Mixtape (2010) – I have to be honest here, after listening to two disappointing albums and an undeniably bad one, I didn’t have the heart to listen to an unofficial DMX release well into his demise. I skipped this and I’ve literally never heard one person even mention it, so I can’t imagine it’s worth listening to. The Weigh In EP (2012) – See above. Current Status: Barely alive. He was actually found without a pulse and not breathing in February of 2016 from what seemed to be a drug overdose. I’ve read that he has cancelled shows in 2017 because of a “medical emergency.” X and Swizz Beatz have posted on social media about new DMX music coming in 2017 and it is rumored to feature Dr. Dre and Kanye West. While it would be cool for DMX to release something good, it seems unlikely at this point in his career and I’m honestly much more interested in seeing him get healthy than I am in hearing new music. All-Time Status: Outside my Top 50. You are currently browsing the The Bat Cave blog archives for May, 2017.